On this date in 1944, two-and-one-half months after the Allies had landed in north­ern France (Opera­tion Over­lord) and one day after thou­sands of service­men from the U.S. Seventh and French First armies had landed by air and sea on the French Rivi­era (Opera­tion Dra­goon), Adolf Hitler reversed him­self and ordered his troops out of Nor­mandy to a new defense line in north­eastern France on the Somme and Marne rivers. The Franco-Ameri­can landings in south­ern France opened a second front, pro­viding the Allies with addi­tional and sorely needed port facili­ties at Mar­seille and Tou­lon. Over the next two months the Allied advance north­ward from the Medi­ter­ranean coast through the Rhône Valley pushed the Ger­mans toward their own border. The advance came to a halt at the foot­hills of the Vosges Moun­tains due to lack of fuel. There the U.S. Seventh Army linked up with Gen. George Pat­ton’s Third Army moving east from Nor­mandy, to become part of Gen. Dwight D. Eisen­hower’s Euro­pean Theater com­mand. In their Vosges Moun­tain for­tress, the toughest ter­rain on the West­ern Front, retreating Wehr­macht sol­diers were ordered by Hitler to stand and fight. The Vosges Moun­tains cam­paign is notable for the rescue of “The Lost Bat­talion,” the 1st Bat­talion, 141st Infan­try, which was sur­rounded by Ger­man forces on Octo­ber 24, 1944. In five days of battle, from Octo­ber 26 to Octo­ber 30, the 442nd Regi­mental Com­bat Team, a unit com­posed of mostly second-genera­tion Japa­nese Ameri­cans (Nisei), broke through Ger­man defenses and rescued about 230 men while suffering over 800 casu­al­ties. (The 442nd is considered to be the most-deco­rated in­fan­try regi­ment in the history of the U.S. Army. Its record-setting deco­ra­tion count earned it the nick­name “Purple Heart Bat­talion.”) The Allied victory in the monthlong Vosges slug­fest freed Patton to focus on driving east to the Rhine River and striking into the Ger­man heart­land. Hitler, how­ever, had one last ace up his sleeve, which he played in the Ar­dennes forest of Bel­gium and Luxem­bourg, site of the Battle of the Bulge in Decem­ber 1944. It was Ger­many’s last-ditch effort to stop the Allied advance into Germany proper, and it failed. 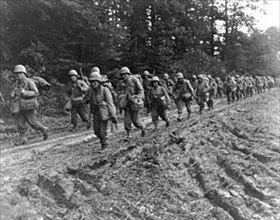 Left: The 442nd Regimental Combat Team hike up a muddy French road, late 1944. The newly formed Nisei 442nd Com­bat Team left the U.S. on May 1, 1944, and landed at Anzio, Italy, on May 28. In August the unit took part in Opera­tion Dra­goon, the inva­sion of south­ern France, and traveled 500 miles up the Rhône Valley, by walking and by rail, until Octo­ber 13, when it reached the Vosges Moun­tains. On Octo­ber 23 the unit, whose motto was “Go for Broke,” was ordered to rescue the “lost bat­talion” of 141st “Alamo Regi­ment” of the 36th (Texas) Divi­sion. It cost the 442nd 800 casu­al­ties to rescue 230 men. 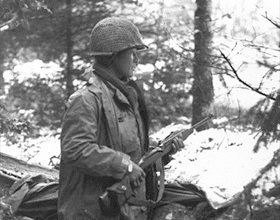 Right: A 442nd squad leader looks for Ger­man move­ments in a French valley 200 yards away, Novem­ber 1944. The 442nd was the most deco­rated unit for its size and length of ser­vice in the his­tory of Amer­i­can war­fare. Its mem­bers—in total, about 14,000 men—received 18,143 awards, including 9,486 Purple Hearts. The unit was awarded an unpre­ce­dented eight Presi­dential Unit Cita­tions. 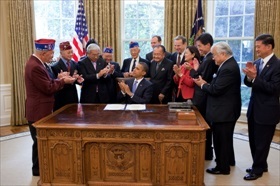 Twenty-one of its mem­bers were awarded Medals of Honor, including future sena­tor Daniel Inouye of Hawaii. The men of the 442nd Regi­mental Com­bat Team accounted for just over 40 per­cent of the Jap­anese Amer­i­cans who served in the U.S. military in World War II. Left: When President Harry S. Truman welcomed the return home of the 442nd Regi­men­tal Com­bat Team (raised on the main­land) and its com­po­nent 100th In­fan­try Bat­talion (raised in Hawaii), he said: “You not only fought the enemy, but you fought pre­ju­dice and you’ve won.” On Octo­ber 5, 2010, Presi­dent Barack Obama signed a bill granting the Con­gres­sional Gold Medal col­lec­tively to the 442nd Regi­men­tal Com­bat Team and the 100th In­fan­try Bat­talion in recog­ni­tion of their dedi­cated ser­vice during World War II. The award was also extended to the 6,000 Japa­nese Amer­i­cans who served in the Mili­tary Intel­ligence Service during the war. 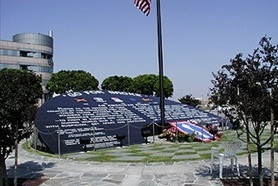 Right: The Go For Broke Monument in Little Tokyo, Los Angeles, Cali­for­nia com­memo­rates the 33,000 Japa­nese Amer­i­cans who served in the U.S. mili­tary during World War II—the famed 100th In­fan­try Bat­talion and 442nd Regi­mental Com­bat Team, as well as lesser-known Nisei units, the Mili­tary Intel­ligence Service, the 522nd Field Artil­lery Bat­talion, the 232nd Com­bat Engi­neer Com­pany, and the 1399th Engin­eering Con­struc­tion Bat­talion. “Go For Broke!” was the unit motto of the 100th Bat­talion and was adopted by the 442nd RCT. It has since been adopted as a motto for all of the Japanese American units formed during World War II.